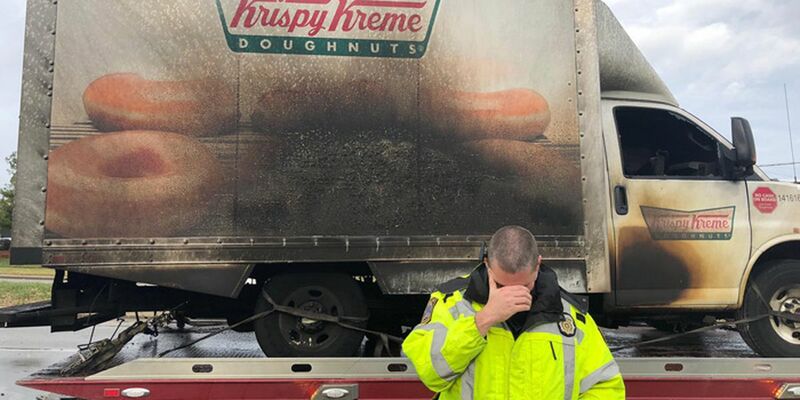 Police in Lexington, Ky. mocked themselves after a fire that destroyed a Krispy Kreme doughnuts truck and the doughnuts inside. Other law enforcement agencies jokingly sympathized with the officers. "No words", the officers wrote in a tweet alongside the photos, including a crying emoji. According to WKYT, the fire was quickly extinguished and thankfully no one was injured, but the same can't be said for the truck's precious cargo. Police departments around the country were quick to send messages of support to their colleagues. "We feel your loss", the University of Kentucky Police Department wrote. "Your brothers and sisters in MA are here for you during these tough times". "Prayers to LPD as they deal with this loss", authorities wrote in a Facebook comment. "This literally hurts my soul".